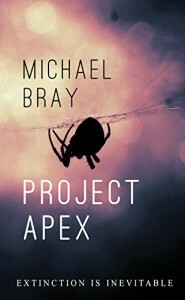 LIMITED TIME ONLY: Anyone who pre orders the second book in the Project Apex series, Eradication, can get it for a super low price of just 0.99! The price will revert back to the normal list price of 2.99 on release day, so grab it quick! What if man's thirst for knowledge resulted in it's own destruction? Richard Draven is a scientist interested in the healing properties of primates and transferring them to humans. When he discovers a new species of monkey with amazing regenerative powers, he has no idea that his report will set off a chain of events with dire consequences. Six years later, and Draven’s research has been put into practice. The government has engineered a virus which has begun human trials. It’s job – to make the armed forces of the world better, stronger, faster in their numerous conflicts across the globe. Something, however is not right. Disturbing reports about the behaviour of those modified by the virus are growing in number raising concerns amongst those in charge that something has gone wrong. As the Apex teams go dark and stop responding to orders, the government discover that there is a much more sinister force at work. Joshua Cook is the alpha male, the first man to be administered the virus and bond with it successfully. Joshua is tired of the human race, tired of their self-destructive nature. He has a plan, one which involves wiping the slate clean of the ‘lesser’ edition of the human machine and repopulating the earth with his own kind. As the full and devastating scale of Joshua’s plan begins to unfold before the eyes of the world, the government are forced to turn back to Richard Draven in an effort to find a way to stop Joshua and his growing army before he can eradicate humanity from the planet. A tense, global thriller taking place across multiple countries, from the government-centric streets of Washington to the slums of Mumbai and the burning heat of the Iraq desert, Project Apex features a rich and varied cast of characters each with their own motivations and sub plots through the main narrative as they tell the very human story of a disaster on an unprecedented global scale where people are forced to do things they never imagined possible, and in some cases revert back to the instinctive savagery long repressed by our species as society starts to crumble the world over.